“What are you thinking?” Rosh asked, as he snuggled in with Josh in his younger son’s bed. Josh had been lying in his bed staring at the ceiling. “About a creative writing piece I’ve written up for my next assessment,” answered Josh. Rosh nodded. Josh got up and fetched his story. “Hot off the press,” he said as he handed it to his father. The sun looked sadly down upon the city of Shar Shar and descended behind the mountain range with a heavy step. Dark ominous shadows slowly crept up on the city. A tired breeze gathered softly what leaves were left on the almost barren trees and renounced them. A hot earthy smell rose from the sun-baked earth filling me with a lethargic yet contented drowsiness. The chatter of birds and chirping of cicadas had mellowed, as they too were getting ready to settle down after a long day. I took off my worn shoes and sodden rags which reeked of hard yakka and settled down on the barren crusted land, under the rusty mud-brick roof. My roof. Night climbed up my walls stealthily as I lay on my bruised and abused back looking up into the heavens. A deep relaxing sleep overtook me. I dreamt of peace. I dreamt of a happy place. I dreamt of a happy peaceful place where my family and I could relax and be free of fear. My young children danced around joyously on the soft green fields with striking flowers of many colours and the sun beamed down upon them from the endless clear horizon. It was simple, yet so beautiful. It was a life ironically, that I could only dream of. 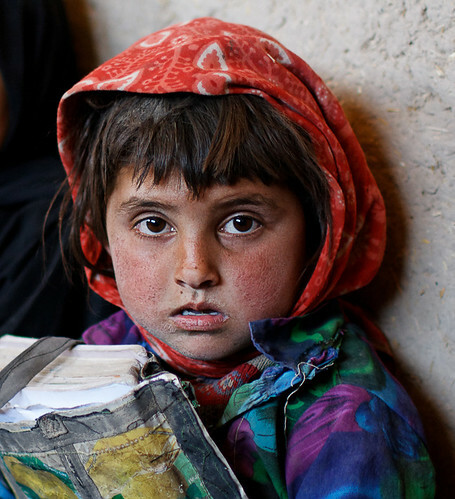 Afghanistan was being torn apart by war. My daughter was running up a steep gravelly slope playing with her brother. Her foot slipped and she fell. Her shriek startled me, shattering my dream. I awoke with a start. My eyes flicked open, and I looked about me incomprehensibly. I was where I had slept last night, but it all looked different now. What had happened to my home? It was in tatters. The roof was gone, the walls blown apart. A shrieking missile tore down towards me from the sky. I stared at it in paralysed dismay. It landed a short distance away, tearing up the countryside. The impact of its shockwave knocked me senseless. As I emerged from my stupor, I noticed flames consuming neighbouring huts voraciously. I stumbled up on my feet and wavered drunkenly. There were large new depressions in the once-flat ground around me. I heard cries, but what they wanted failed to register on me. Some sounds were near, some far. Some were distinct, some unrecognizable. I looked in sheer horror at my mother lying on the ground like a broken doll. Her arm was twisted unnaturally and a leg was missing. Another bloody decapitated body lay beside her. It was my brother. It broke my heart to see her beating her breasts as she lolled beside him, shaking his body as if her feeble efforts to wake him up would bring him back to life. A tear involuntarily rolled down my dirty blood crusted cheeks. I sat perfectly still as if I was frozen. Time stood still. I tried frantically to comprehend what was happening. Nothing made sense to me. Why was this happening? Why had it happened to us? I trembled and shuffled uneasily forward towards my grief-stricken mother. I picked her up in my skinny arms and made an attempt to turn. I almost dropped her. Slowly, I clambered out of my broken house, swaying from side to side like a drunken man walking. My mother strained her neck back, staring at the motionless body on the ground. Her good hand stretched towards it earnestly, not ready to let go and her mouth babbled unfathomable pleas. I felt confused, afraid and angry. Why couldn’t she stay still? She was making it difficult for me to carry her. I was so exhausted, I was almost ready to drop her right there. A blinding flash lit up the skies, and a thunderous clap followed it down. Another missile flew past, deafening my ears, snatching the earth out from beneath my shaky legs, as if it was just a sheet beneath my feet that someone had effortlessly pulled away from under me. I dropped my load and sank on my knees beside her. I turned around terrified, in sudden remembrance of my children. Dread filled my heart, yet fear surged in my limbs lifting my body in an involuntary spasm as I rose and stumbled back inside the rubble that had once been my home. Then I saw them, huddled in a corner with my wife. They were safe. Tears of relief blinded me. As I began to regain my composure, I was surprised at my relief. My home was shattered, my neighbours burning, my brother was dead, and my mother was broken. The human mind lingers not on tragedy. It chases after hope. Hope keeps him alive. It is the fountain head of the resilient human spirit. I looked around. I didn’t know what to do, but I had to get them all out of here. We weren’t safe here. Not tonight, not ever now. Fear cleared my mind. Suddenly I realized that as the eldest male, it was now my duty to protect those who had survived, and farewell those who had not.